The 1849 New York state election was held on November 6, 1849, to elect the Secretary of State, the State Comptroller, the Attorney General, the State Treasurer, the State Engineer, a Judge of the New York Court of Appeals, a Canal Commissioner and an Inspector of State Prisons, as well as all members of the New York State Assembly and the New York State Senate. After the split in 1847 and 1848 which had led to the loss of all state offices, Barnburners and Hunkers now combined again and nominated a Democratic ticket. The Hunker state convention met on September 6 in Syracuse and nominated Lott, Chatfield, Follett, Clark, Hiram Denio for the Court of Appeals, Jesse C. Dana for Secretary of State, Darius A. Ogden for Treasurer and John D. Fay for State Engineer, and offered the Barnburners to substitute the latter four. The Barnburner state convention met on September 12 in Utica and nominated Jewett, Randall, Welch and Campbell, to complete the joint ticket. The whole cross-endorsed Anti-Rent ticket was elected again, this time four Whigs and four Democrats.. The incumbents Morgan, Washington Hunt, Alvah Hunt and Jewett were re-elected. The incumbent Beach was defeated. Three Hunkers and only one Barnburner were elected on the Democratic ticket. 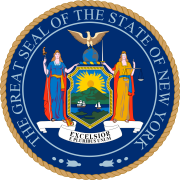 17 Whigs and 15 Democrats were elected to a two-year term (1850–51) in the New York State Senate. 64 Democrats and 64 Whigs were declared elected to the New York State Assembly of the 73rd New York State Legislature. ^ The number of votes is the total of Whig and Anti-Rent votes for Morgan, Washington Hunt, Alvah Hunt and Seymour, and the total of Democratic and Anti-Rent votes for Chatfield, Jewett, Follett and Clark.